It’s the MOST 👏WONDERFUL👏TIME👏OF THE YEAR. It’s Halloween season, and I’m ready. 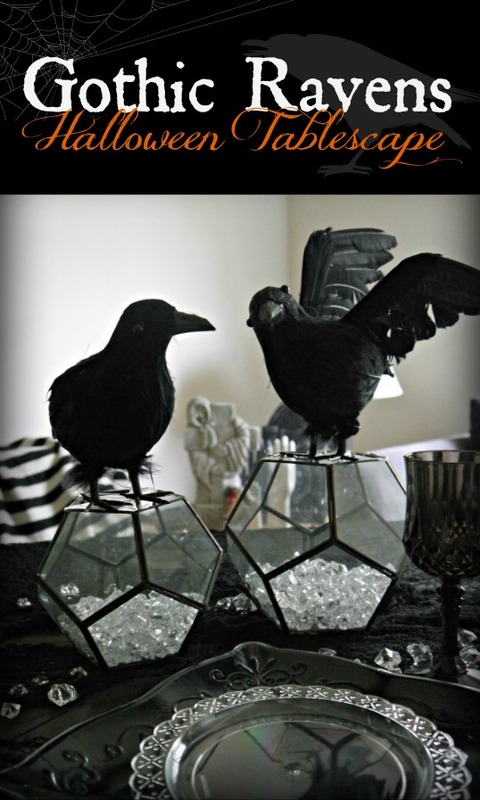 The decor I used in my Halloween raven tablescape was provided to me for free by Oriental Trading Company! I’ll link each piece at the bottom of the post for easy shopping if you’d like to recreate the look for your Halloween party this year. First I laid down a sheer black tablecloth, then layered a creepier, more tattered one on top. Then I made a “suspension bridge” on top of each terrarium with Scotch tape because I wanted to place my ravens on top. I criss-crossed three strips of tape, them trimmed the edges that stuck out past the rim. Then I placed my two spooky friends on top, and they looked quite menacing. In a good way. I think the plate layering option below was my favorite, so once I was happy, I added a smoky black wine chalice to the place setting. If you’re looking to create a different, but still Halloween-y look, check out the Halloween party section on the Oriental Trading website! There are tons of choices so you’re sure to find the black, orange, skeleton-y, and ghost-y goodies you’re looking for. 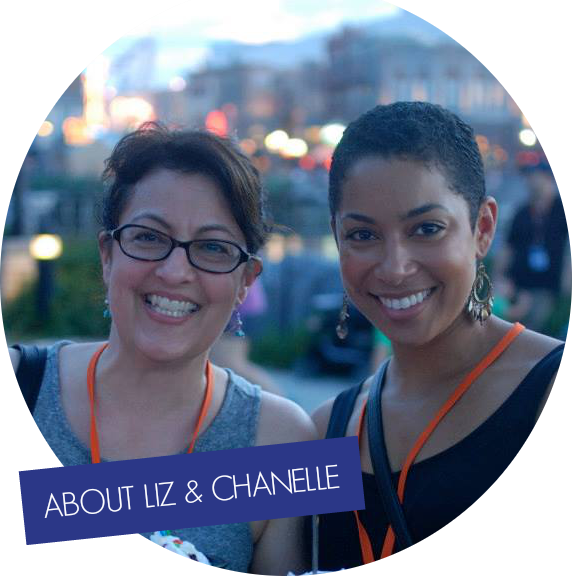 Happy Halloween from Liz & Chanelle! I love simple and easy decor ideas. I have a few of these ravens and haven’t brought them out this year, but maybe I’ll need to 🙂 Thanks for sharing your idea on Merry Monday. 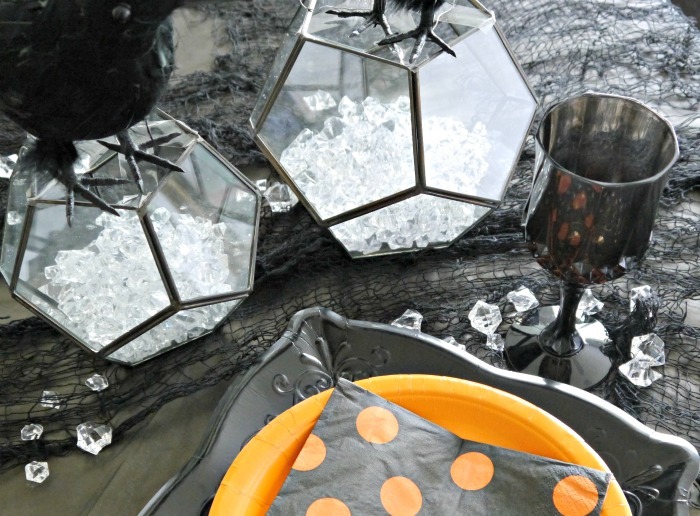 We love Gothic Halloween style over at the Hauntingly Beautiful Decor Halloween Link Party! Hope you will link up this post. Love it! Loved your tablescape; we have “my” real crows around here; they love coming to the compost heap! So decorating with them is normal! My favorite EEEKK! was caused by my son, the prankster. Catatonic before my coffee, I opened the fridge to get the milk jug to add milk to my cup. There was a (Plastic) severed, bleeding hand holding onto the milk jug! Halloween is my daughter’s favorite to decorate for. Me, I have real cobwebs in my house–time is spent on crafting! Spooky cool! I tried a Halloween prank at work. I got bloody footprint stickers to review. Anyhow a girl got mad, said they were disturbing, and I stayed quiet about who put them there. I felt like a kid that got caught with his/her hand in a cookie jar. I wanted to shout out, “They are just stickers!” Ha! These are some great ideas! We love Halloween parties! Your Halloween tablescape turned out so cool! I love seeing different holiday tablescapes! They’re so much fun and so creative. Ah! I love Halloween it’s probably one of my all time favourites next to Christmas. I need to go all out like you. I only do out front of my house but inside really needs some decor! 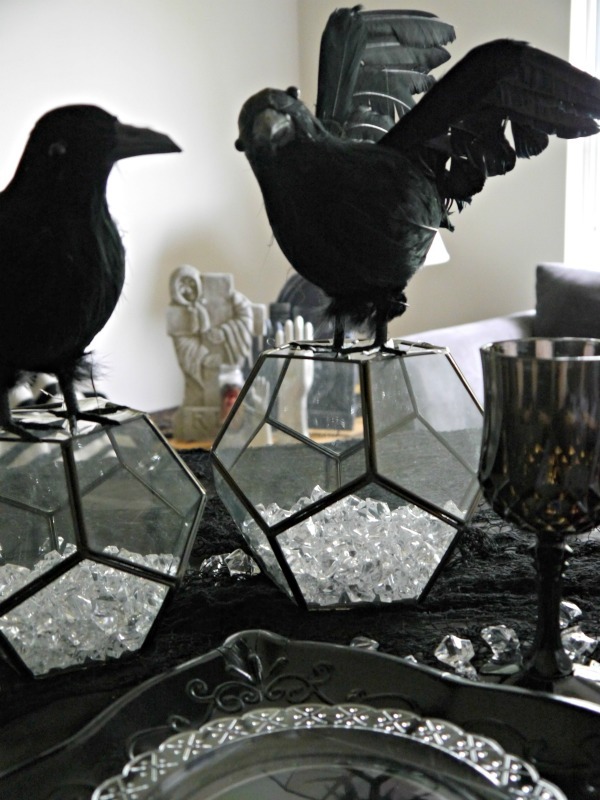 Your Gothic Halloween Raven tablescape looks so great! I really love those glass and metal terrariums with crystal gems! Halloween is one of my favorite times of the year. You did a great job with the decor! This is a cool idea! Such a great theme for Halloween! I really love this idea! Really gorgeous and creative! Thanks for sharing your idea! I absolutely adore your gothic tables cape!! I wish I was half as creative as you are!! What an awesome Halloween decoration. I love that it’s different than what you normally see. Oh my gosh I totally love these! What a genius idea!! This is awesome. It has a more real feel to it than some of the more cartoonish Halloween themes. That is a really cool idea! Ravens have always been interesting to me and my kids. Halloween is my absolute favorite holiday. I just love how you decorated your table, it’s so adorable & something I could totally see myself doing in my own house. Thank you for the idea & have fun decorating. Ohhh I love the layered tablecloth idea! Why haven’t I ever thought of that?! 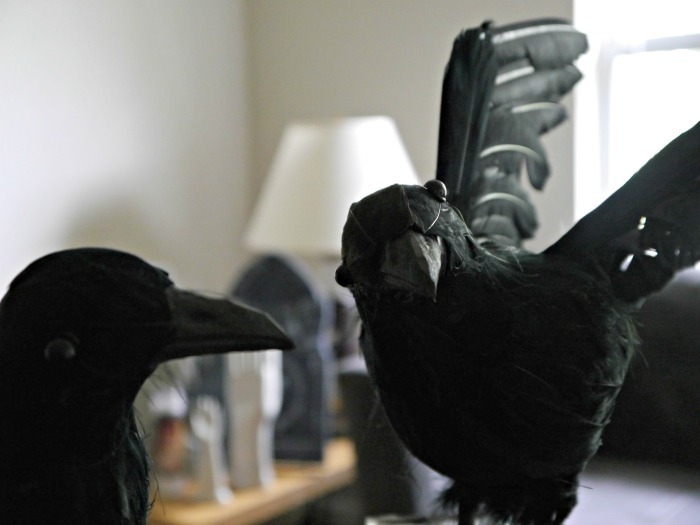 You put together an AWESOME tablescape for Halloween with those ravens. I’m a huge fan of all things Halloween and you definitely hit the mark. Oriental Trading Company makes it all so much easier too. They have so many decorations to offer. And I love what you picked for yours. I think the ravens are a nice touch especially when you’re hosting a dinner party this Halloween. I totally love this! I am a huge fan of Halloween, and I would love to decorate our tables like this for our Halloween party! How fun! The ravens remind me of game of thrones. I think it’s a lovely decoration for Halloween. It’s pretty creepy but there’s also some sort of elegance through it. This is such a pretty tablescape. It would be perfect for my Halloween party this year. I will have to start looking for a few of these decorations. The Ravens are so wonderfully creepy for a tablescape. This is a fabulous Halloween tablescape. Those ravens are super scary, I think my daughter would be afraid to sit near them! This is flipping awesome! I want to come hang with you on Halloween! My daughter and I were just talking about the EAP Bar in NYC. It would be fun to see that! This tablescape is really neat. I absolutely love the theme that you went with. That is siiiick! Love it! So perfect for the season! Love these decorations! Both spooky and fun. And not too difficult either. Love this tablescape. I’m trying to decide what I want to do with my table for our annual Halloween party. I absolutely love this tablescape. It’s spooky and perfect for Halloween. I know we would adore having this, ravens are so awesome. I love, love Oriental Trading Company! Your tablescape is fantastic. What a spookily awesome tablescape for this time of year! I have mostly pumpkins and scarecrows up around my house right now. It’s mostly pumpkins at my house too. I need to do something spooky like this. This is such a spooky tablescape and is perfect for a Halloween dinner party. I love Oriental Trading Company, I have been buying decorations from them for years. They always have a great selection. Oh my goodness, I am loving this tablescape, what a great idea to use ravens for it and I love the gothic vibe you have gone for. That table is too good to rearrange and use as your workspace until after Halloween. You need to let everyone see it and get in the spooky “never more” mood. The Oriental Trading Company has such amazing decor. I use them every single chance I get. I usually find things that I won’t find anywhere else! I love this! Its so perfect for Halloween or even a themed party! Sucha cool idea! 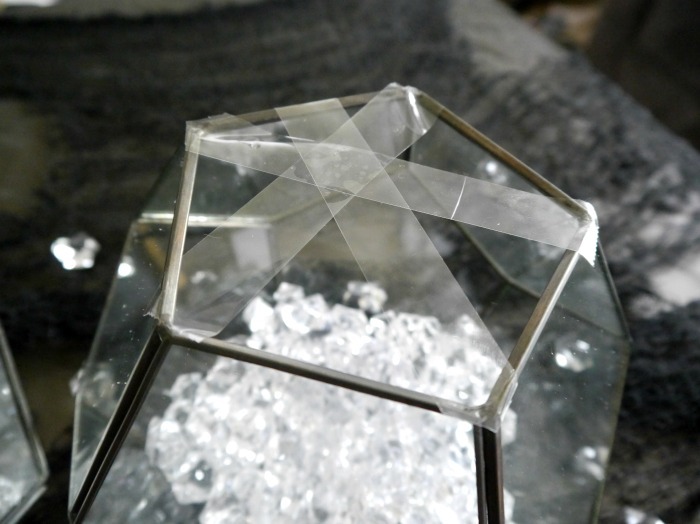 That geometric terrarium is absolutely amazing! I think you used them perfectly for Halloween. LOVE how this turned out. What a great tablescape! I love how easy it seems to put together (and I’m quite fond of ravens as well)! I actually have always likes ravens. 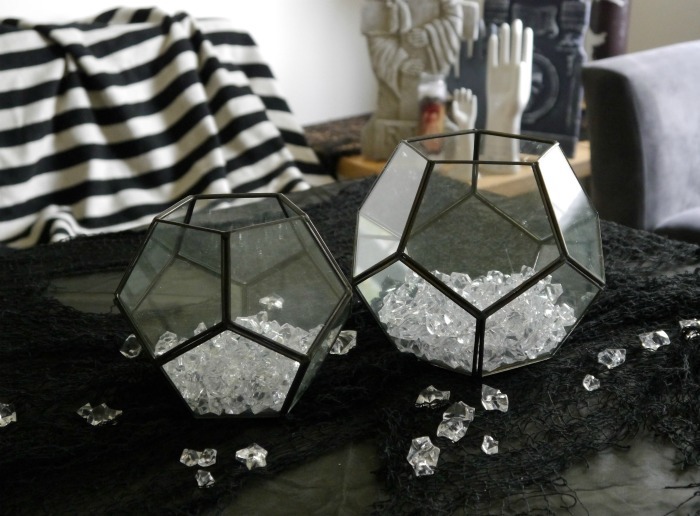 Your tablescape is very pretty and love the small rocks that look like diamonds spread across the table and in bowls. I’m pretty sure the ravens would give my son nightmares, but I just love them. They look amazing. That looks freakin’ AMAZING! I want you to come decorate my house for Halloween! I never would have considered using fake birds – but it looks so good! Cuuuuuuttttteeee. This would be so awesome for our Halloween party. I am always looking for unique ideas beyond the blood, guts, gore and zombies. You know the typical – yawn – Halloween decor. This is PERFECT! While I enjoy houses that do decorate for Halloween, I don’t decorate my own. It just freaks me out. That tablescape idea is really nice. Not too scary and still elegant. I never think about using scotch tape across stuff like that. I would have been trying to glue them to the edge or something. Oriental Trading has EVERYTHING! We use them all the time for stuff at church! That’s such a fun centerpiece idea! The ravens definitely look menacing and it has a fun, eery feeling for Halloween! This is some fabulous decor. I’ve always enjoyed Oriental Trading Company. I like your ravens! I like how your decorations aren’t all jack o’lanterns and witches. The tablescape looks so sophisticated and the orange plates makes it pop. I am loving the terrariums. I have a few ravens too and I’m so glad you gave me some ideas on how to display them. I was pretty much at a loss of where to use them in my Halloween decor. Love the tablescape! Gah! I LOOOOOVE this so much! I am all about that gothic look when it comes to Halloween decorations. You did such a good job with this. This is so cool. I would love to surprise my family with a table like this for Halloween. I’ve always enjoyed the Gothic look. You did a fantastic job.